Rev. Fr. Yesai (baptismal name Sarkis) Bedros was born on August 22, 1985 in Kamishli, Syria. In 1987 he and his parents established residence in Aleppo. He received his elementary education from Haigazian School in Aleppo and after graduation, at the age of 12, he was accepted to the Seminary of the Armenian Catholicosate of the Great House of Cilicia in Lebanon. After completing four years of secondary school, Sarkis received four years of theological and Armenological education from the Seminary. He was ordained a Sub-Deacon on May 5, 2002 by the late Bishop Vartan Demirjian. On May 11, 2003, he was ordained into the Diaconate by His Eminence Archbishop Yeprem Tabakian. He received his diploma after graduating from the Seminary. On July 9, 2006, he married Vartine Garabedian. Deacon Sarkis was ordained as a married priest by H.E. Archbishop Kegham Khatcherian on August 7, 2005, and was renamed Father Yesai. He celebrated his first Divine Liturgy at St. Mary Armenian Church in Lebanon on September 11, the Feast of the Exaltation of the Holy Cross. On September 28, 2005 he traveled to the city of Isfahan in Iran where he began his pastoral mission being appointed as Pastor of St. Stepanos Armenian Church in New Julfa. He returned to Lebanon four years later to serve at Holy Resurrection Armenian Church in Jounieh until 2013. Fr. 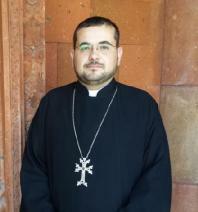 Yessai recently joined the Western Diocese of the Armenian Church. At. 29 years of age Fr. Yessai is an energetic young priest, who brings to the St. Paul parish a new level of excitement. His dedication to the Church and the Armenian people is founded in a deep level of spirituality.